There are more than 2 million people nationwide who have licenses to sell real estate, however less then half are members of the National Association of Realtors (NAR)? Only members are entitled to use the term "REALTOR®." Do you have a REALTOR® working for you? Please use the GREEN MENU BUTTONS above to Navigate to the area of interest or the hyperlinks below. All Photos Copyright © 2009-2013 TheAlohaBoy.com. All Rights Reserved and Protected by International Copyright Laws. No photographs on TheAlohaBoy.com may be used in any way without written permission. 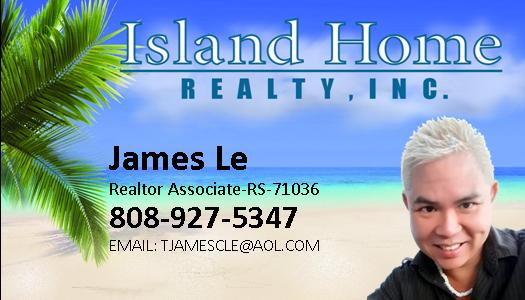 The Aloha Island Boy operated under J&J Innovations LLC, and is not related to Hawaii Paradise Properties, INC. or Island Home Reality, INC.